The post Another successful year for Africa Integrity Indicators! appeared first on Global Integrity. Global Integrity is pleased to announce the release of provisional data for the seventh round of its Africa Integrity Indicators (AII), available here. This provisional data is available for public comment until May 31, 2019. We invite interested stakeholders to examine the data and share any feedback that can help increase its quality and usefulness. Don’t be shy – We value your input! Below are some of our preliminary findings, but stay tuned! In the upcoming weeks, we will be starting a conversation to better understand how our data could help support your work. The independence of the judiciary is under threat: In several countries, notably Ghana and Kenya, governments have taken steps to hamper the independence of the judiciary. Bypassing public procurement guidelines: While regulations are supposed to control public procurement, there is a surge of contracts awarded without competition in Liberia, Benin and Mauritania. In Kenya, allegations of corruption in public procurement are increasing. Crackdown on the publication of information: While some countries made progress towards open publication of information (notably Ethiopia and Sierra Leone, with substantial improvement from last year), more countries regressed, experiencing more censorship and/or self-censorship of media organizations and citizens’ online content (social media, blogs, etc). What is the Africa Integrity Indicators Project, anyway? Every year since 2013, the Africa Integrity Indicators project assesses the state of governance and aspects of social development across all 54 African countries. It produces qualitative data through 102 indicators in 13 categories addressing transparency and accountability, as well as social development. The Africa Integrity Indicators data is a stand-alone assessment published by Global Integrity. It presents snapshots of evidence for each indicator, providing a score, the justification, and supporting sources. Our goal is simple: to build accurate and reliable data, with an interface that enables the data to be examined at the country level (say, by tracking a country’s progress over time with regards to one particular indicator), and at the subject level (say, by comparing different countries’ performance on one indicator). We want our data to empower actors at the national and regional and international levels working to advance governance reforms, and to foster a discussion on how governance challenges can be tackled. We also strive to be rigorous and transparent; you can find our methodology here. Previous rounds have addressed both “in law” and “in practice” indicators. In this round, we decided to focus solely on the “in practice” indicators. This is because prior rounds have highlighted “implementation gaps,” or the lag between the adoption of regulations aiming to improve certain issues, and the actual improvement on the ground. So this year, we are prioritizing citizen’s experience in practice. (Don’t worry, we’ll include updates on the laws every three years to make sure we capture big changes and continue to provide a basis for assessing the implementation gap, a measure which we continue to feel provides an important starting point for understanding whether and why gaps persist, and what might be done to close the implementation gap). 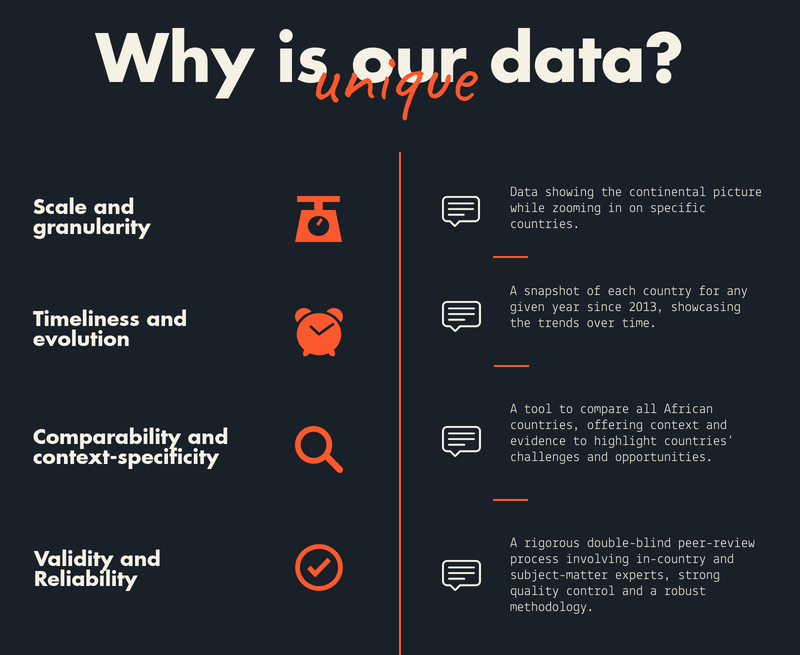 How is our data unique? How can you use our data? Our work has been used by several institutions. Data that we collect against a number of questions feed into the Ibrahim Index of African Governance and into the Worldwide Governance Indicators (WGI) by the World Bank. Through the WGI, the data also provides the Millennium Challenge Corporation with information that informs its decisions about country eligibility for Millennium Challenge Corporation compacts. But you can use our data, too! Action-oriented: indicators are based on fact-based and country-specific qualitative research, which provides insight on what should be priorities for reforms. We want to hear from you. Check out our preliminary data and give us your feedback. You have 2 months to help us improve our work! If you have comments on specific facts and narratives or if you have suggestions related to the accuracy of our research, please contact us at aii@globalintegrity.org. If you have general comments and suggestions about the usefulness of the data, how you use it, and how it can be improved, please submit your feedback in this form or the aforementioned email address. You can also connect with us on Twitter (@GlobalIntegrity). The post Sept années de réussite pour les indicateurs d’intégrité en Afrique! appeared first on Global Integrity. The post Transparency: From revolution to evolution appeared first on Global Integrity. The transparency and accountability agenda has come a long way from the heady days of 6 or 7 years ago when enthusiasm, including mine, about the revolutionary potential of transparency – and data – reached its peak. At that time, the emphasis was on establishing global norms on the disclosure of information, and encouraging countries to sign up to those norms. 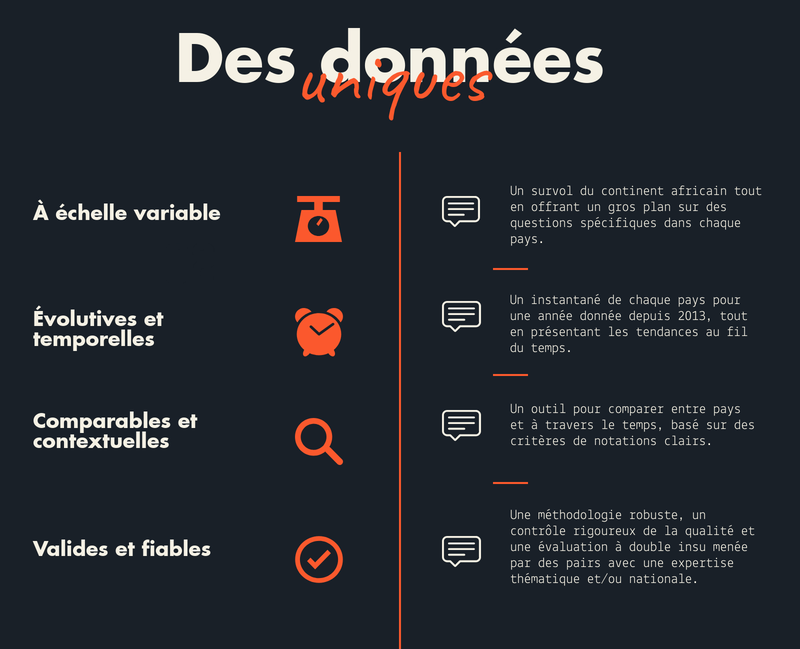 The theory of change was that the data being made available – data about foreign aid, data about budgets, and data about extractives revenues for instance – would be used by citizens and civil society organizations to hold governments to account. This would then drive progress towards more effective governance and better development outcomes. Over time, important questions began to emerge about whether and under what circumstances transparency would actually lead to accountability and better development outcomes, what preconditions might be necessary for progress to be made, and what obstacles might hinder progress along this path (see for instance Tiago Peixoto, 2012; Tom Carothers and Saskia Brechenmacher, 2014; Stephen Kosack and Archon Fung, 2014; and, more recently, John Gaventa, 2019). Such questions and concerns steadily nudged the evolution of the agenda towards one which gives greater emphasis to not just making data available, but also to thinking carefully about the quality of the data, and, most importantly, who might use the data, in what ways, and to what end. This has been a hugely important step forward, and has been accompanied by increased, albeit patchy, recognition of: the value of starting with particular service delivery or sectoral challenges (see, for instance “Governance and Sector Outcomes” by Derick W Brinkerhoff and Anna Maria Wetterberg), rather than data and data-related tools; and, of the fact that political economy dynamics – the patterns of winners and losers from potential governance reform – play a major role in determining whether policy commitments are effectively implemented. Data, in this version of the agenda, may support progress to more effective governance, but only when users are able to deploy data in ways that help to shift the political dynamics of the systems that hold problems in place. At Global Integrity, we’ve been pleased to play our part in the evolution of the transparency and accountability agenda. Our work focuses on exploring whether and how open processes of governance can support the cycles of locally-led innovation, learning and adaptation that are needed to address complex governance-related challenges, with support for the use of data a central strand of our efforts. This has included our support for Mexican partners’ efforts to use data to follow the money, for instance in Durango, and our ongoing work with the Transparency and Accountability Initiative on the use of data to tackle corruption in Nigeria and Colombia. We’ve also taken the opportunity to engage with key actors including the World Bank, DFID, the Open Society Foundations, the International Budget Partnership (see also Tom Carothers and Saskia Brechenmacher, 2018, on “revisiting the foundational assumptions of fiscal transparency and accountability work”), the Open Contracting Partnership and the Open Data Charter as regards their approaches to tackling governance-related challenges, and the ways in which transparency might help. The increased attention given to problems, users and use is very much a step in the right direction. And the wider acknowledgement that governance-related challenges are about power and politics is very welcome. However, important questions continue to be raised about the value of transparency and open governance, and their purchase on what are fundamentally questions of power and politics (see for instance, David Booth’s valedictory lecture from 2018). These are questions which merit serious consideration from champions of transparency and open governance. The core question is perhaps whether and how transparency, participation and accountability might support the emergence of effective, feasible and context-sensitive approaches to governance reform? Questions of this sort are being given careful consideration in a variety of fora. In the extractives sector, for instance, these questions are live issues: in the work that the Brookings Institution, the Natural Resource Governance Institute, and Results for development are leading on “Leveraging transparency to reduce corruption”; in the International Finance Corporation’s work on “from disclosure to development”; in the increased attention being given to the use of data by the Extractive Industries Transparency Initiative, the Executive Session on the Politics of Extractive Industries, and others; as well as in various initiatives to harness the power and potential of open data to tackle corruption (see also our chapter on open data, accountability and anti-corruption, penned by Jorge Florez and Johannes Tonn, for the forthcoming State of Open Data Report). However, peering towards the horizon, and beyond the confines of an agenda that starts with transparency, we see a new frontier coming into focus. This frontier can be seen, in different ways, in the work of Lant Pritchett and colleagues on Deals and Development, and in the work of Mushtaq Khan and colleagues at the SOAS Anti-Corruption Evidence Research Consortium (SOAS-ACE), the sister programme to the Global Integrity Anti-Corruption Evidence Programme. For instance, a project in Bangladesh funded via SOAS-ACE explores whether it might be possible to leverage transparency about the quality and pricing of identical formulations provided by different companies, to get the support of a second tier of pharmaceutical companies for changes to the ways in which pharmaceuticals are priced, and to address the issue of big players offering illegal incentives to doctors to prescribe more expensive drugs. Involving participants from the pharmaceutical sectors seeks to make reform politically feasible. In this sort of example, one does not start with transparency and data; instead, changes to the informational environment are considered as one way of working with incentives in order to shift the prevailing power dynamics and thereby address the governance-related challenges around a particular problem or challenge. This, we feel, is a hugely important step forward. It’s an approach that starts with problems, pays attention to the power dynamics in particular places, works actively to identify politically feasible reforms, and then and only then considers whether changes to the informational environment brought about by increased transparency might help to create coalitions for reform that can shift the dynamics that would otherwise hold problems in place. Such an approach would put political economy dynamics and patterns of incentives – the things that drive governance-related challenges – at the center of analysis and action. The key question then would be whether and how cycles of politically-engaged learning, focused around particular sectoral problems, and strengthened by a richer informational environment, can support the identification of ways forward that have the potential to win the support of at least some of the powerful players, provide opportunities for new players, and thereby build a winning coalition for reform. Working out what this sort of approach might look like in practice won’t be easy; starting with complex problems is harder than starting with data, tools, or illusory blueprint solutions. Beyond the mainstream of the transparency and accountability agenda, progress is being made, in different ways, including through the work of SOAS-ACE, the problem-focused work of the Building State Capability team at Harvard University, the pioneering work of Yuen Yuen Ang on How China Escaped the Poverty Trap, the approach to supporting reform taken by the Tony Blair Institute for Global Change, and through the efforts of Global Integrity and other organizations building bridges between open government and adaptive development. Taking this next step – starting with problems, engaging with political economy dynamics, taking incentives seriously, and considering whether and how a richer informational environment can support the emergence of winning coalitions for reform – has the potential to transform not only the transparency and accountability agenda, but the wider anti-corruption and governance agendas. We’re excited to be part of this evolution and look forward to exploring the potential of transparency and open governance to shift the incentives and political dynamics that hold particular sectoral and service delivery challenges in place. The post Practical support to address problems, politics and incentives – Annual Report 2018 appeared first on Global Integrity. For those of us keen to support progress towards more open governance, 2018 was a challenging year. The politics and incentives that all too often drive the rich and the powerful to act in their own short-term interests, make the road towards more open and effective governance a very bumpy one, full of obstacles, in the US and globally. Supporting those at the sharp end of navigating the obstacles, and addressing governance-related challenges, requires much more than promoting transparency and extolling the virtues of openness. As this edition of the Integrity Insider details, over the course of 2018 we provided practical support to local partners around the world as they tackled governance-related challenges. This included supporting partners in Kenya, as they sought to improve the provision of agricultural extension services to local farmers, and helping government officials and citizens in Durango, Mexico, in their efforts to track the flow of public resources. Informed by our country-level work, and that of other organizations, we also sought to nudge the evolution of the governance agenda. This included providing detailed feedback on new strategies by DFID and OSF, setting out how the fiscal transparency agenda might be strengthened, and continuing to build bridges between the opengov and adaptive development communities. We have been pleased to see the open data, and the governance agendas, focus increasingly on problems, politics, and incentives, and the use of data to inform cycles of action and learning to address those problems, in line with the direction we’ve been heading. As 2019 rolls on, we look forward to providing problem mapping, data use, and strategy & learning support to front-line actors and their international partners as they address challenges around the management and use of public resources, and to sharing the insights and evidence generated from this work in order to inform policy and practice on governance and development. There are major challenges to address, but with a strengthened and more diverse team and board, and exciting new work underway, including through the Global Integrity Anti-Corruption Evidence Programme, we are up for the challenges and set to make 2019 our best year yet! The post Wanted: Communications Lead appeared first on Global Integrity. To apply, please submit a cover letter detailing relevant skills and experience, a publication list, three writing samples, and a resume. Applications from candidates who would strengthen our diversity and bring additional perspectives to the team are particularly encouraged. The post Action, Learning, Impact – How Global Integrity Can Contribute to the Evaluation of the Open Government Partnership appeared first on Global Integrity. At Global Integrity, we support local change agents – governments and civil society organizations – in countries and communities around the world as they craft, implement and refine solutions to the complex problems they face. We help our partners more effectively close the gaps between policy commitments, their implementation, and impact. We use the insights and evidence that emerge from our innovative work with local partners to inform and influence multilateral and bilateral development agencies, multistakeholder initiatives, international organizations, and other external actors, encouraging and supporting them to operate in ways that prioritize the locally-led innovation, learning, and adaptation that is key to solving governance-related problems. For more on what we do, and why, see this recent blog. We know the Open Government Partnership (OGP) well. We enjoy robust partnerships with OGP stakeholders in many countries. We’ve helped many in-country stakeholders in Latin America, Africa, and Asia work out whether and how to engage with OGP, and supported their efforts to design and implement effective action plan commitments. From our office in the Open Gov Hub, where the OGP Support Unit is also located, we support collaborative learning and action – including on OGP – among many of the international organizations working to advance the open government agenda. We are well positioned to contribute to the upcoming OGP evaluation. We will help ensure that each of the evaluation’s four objectives – enumerated below – are met. We have been involved with OGP since its launch and have spent 8 years exploring the factors that shape the ways in which reform-minded actors – in-country CSOs and government agencies, as well as international organizations – are able to leverage the OGP platform, to drive progress on open governance (as in our Learning to Open Government work). We know how to produce rich, qualitative evidence – including through country case studies – on OGP experiences, and are well-placed to further explore whether and how OGP supports effective reform processes. We’ve studied the implementation gap – the difference between policy commitments and what actually happens in practice – for a long time. We’ve helped partners in many countries unpack the causes of implementation gaps, and work out how they might close those gaps, to design and implement effective policy commitments that address citizen priorities (as in our Follow the Money work). Our expertise on these issues make us well-suited to help assess whether and how OGP action plans help deliver solutions to the problems that affect people’s lives, and work out how they might be improved. Supporting iterative, real-time processes of learning that inform action, support communities of practice, and strengthen the impact and effectiveness of our partners, is at the very core of what we do (as in our Learning to Make All Voices Count work). We know how to help partners produce and use real-time evidence, generate and share lessons, and make informed course corrections. We can ensure that the evaluation drives action by in-country reformers and international organizations, and helps to build the global evidence base on open governance. We regularly support external actors – including donors, INGOs, and MSI secretariats – in their efforts to strengthen their impact and effectiveness. We know how to tailor learning products to the needs and interests of key stakeholders (see this brief, from our L-MAVC work, for example). We know how to make the links between research and action (as in our GI-ACE program), and are well-placed to help the evaluation inform action on the part of OGP’s supporting institutions. We’re excited about the OGP evaluation opportunity. We’re keen to ensure that the evaluation generates relevant lessons, informs action, and lays the groundwork for strengthening the impact of organizations working to support progress toward more open, accountable, and effectiveness governance across the world. Interested in working with us? Let’s chat – contact us @Globalintegrity, or email michael.moses@globalintegrity.org. The post Stepping Back to Move Forwards – Announcing Our New Website appeared first on Global Integrity. The post Kicking off GI-ACE: 3 Anti-Corruption Themes & 14 Projects appeared first on Global Integrity. The Global Integrity Anti-Corruption Evidence Programme (GI-ACE) supports 14 research partners around the world in generating actionable evidence that policy makers, practitioners, and advocates can use to design and implement more effective anti-corruption programmes. The Programme has three core themes: addressing the international financial and legal architecture that enables different types of high-level corruption to take place; exploring how to support effective integrity management as one approach to countering corruption; and combating corruption at different scales, including in distinct sectors and jurisdictional levels. Happy 2019 on behalf of the entire GI-ACE team! We are excited to start the new year by organizing the GI-ACE inception workshop in London on January 28 and 29, bringing together all 14 grantees. The workshop serves as the official kick-off for the programme and will ensure we can explore opportunities for synergy and collaboration amongst the new research projects. Most importantly, it will provide a space to learn about, reflect upon and further develop the overarching programme logic. A key aspiration of the Anti-Corruption Evidence programme is to ensure that innovative research is translated into actionable outcomes, informing the design and implementation of new, targeted initiatives. To achieve that aim, we will place major emphasis on promoting and supporting close relationships between researchers and practitioners, in line with a theory of change that will be elaborated during the inception workshop. More details on that theory of change to come in a blogpost next month! It is increasingly well-recognised that most of the established, top-down technical and regulatory approaches to tackling corruption implemented over recent decades have a very poor record of success. Accordingly, there have been growing calls for more flexible and imaginative interventions that take account both of the complexity of how corruption operates in practice and also the importance of contextual factors, and to do anti-corruption, as well as development, differently Notably, there is an emerging recognition that we need to move beyond seeing corruption as a property of nation-states, amenable to both measurement and response at that level. To that end, the GI-ACE programme is organised around three core themes that seek to move forward our understanding of how best to develop anti-corruption initiatives that can have a practical impact. The first theme explores the link between high-level corruption and the enabling international architecture that supports illicit financial flows – for instance, in the banking sector, as well as the role of professional intermediaries such as agents, accountants and lawyers facilitating purchase of property and luxury goods, exploitation of tax regimes, and the use of offshore facilities. Under this first theme, a team led by Dan Haberly of the University of Sussex will explore the effects of moves to create greater transparency in offshore secrecy jurisdictions to understand how they contribute to financial reform efforts. Jacqueline Harvey of Northumbria University will focus on how to meet the challenges of developing systems to increase transparency and trace beneficial ownership in Nigeria. The project led by John Heathershaw from the University of Exeter will assess the effectiveness of the international Anti-Money Laundering (AML) regime, looking at how to counter the use of shell companies in six jurisdictions in Africa and Asia and focusing particular attention on banking and real estate purchases. Finally, Thorsten Chmura of Nottingham Trent University is running a project based on experimental economics that looks at the interrelationship between the international anti-corruption legal architecture and local social norms and beliefs. Everyone is in favour of integrity, but too often it is understood in practice as simply an absence of corruption. We need to understand better how integrity can be positively identified and promoted in both the public and the private sectors in order to build effective models of integrity management – that is, the formal frameworks that ensure public officials and private corporations proactively engage in ethical behaviour, acting with honesty and fairness whilst complying with prevailing legal norms. The second theme will see Mark Buntaine of the University of California, Santa Barbara, organise randomized field experiments to explore how civic expectations may be realigned to counteract corruption, focusing on western Uganda. Another project led by Jacqueline Klopp of Columbia University will run randomized controlled trials to explore the functioning of sauti (a mobile-based platform) in assisting traders to address corruption on the Kenya-Uganda border. Vanessa Watson of the University of Cape Town, meanwhile, will explore the link between urban planning and corruption, focusing on how to support the promotion of professional integrity as an anti-corruption strategy in Zambia and South Africa. Studies of corruption and anti-corruption have generally focused on nation states as their unit of analysis, largely driven by attempts to understand the causes and effects of corruption by using country rankings as proxy dependent or independent variables. Whist this work has been valuable in identifying broad patterns, it can mask significant variation in corruption within countries, and between different sectors. We need to understand better how anti-corruption interventions can work both at sub-national level (regions and, especially, cities) and in sector-specific settings. Under this theme, Gerhard Anders of the University of Edinburgh will lead a comparative study of law enforcement and the prosecution of high-level corruption in Nigeria, Tanzania and Malawi, looking at the effectiveness of particular legal tools. Claudia Baez Camargo of the Basel Institute of Governance will work with colleagues to develop an experimental approach to test behavioural interventions in the Tanzanian health sector, looking to harness social networks through ‘governance clubs’. Another project sees Amrita Dhillon of King’s College London explore different auditing mechanisms (top-down versus social) as tools to ensure effective public service delivery in Indian states. Finally, Ryan Jablonski of the London School of Economics will lead a team that evaluates different mechanisms, including the use of GPS tracking devices, to reduce drug theft in Malawi. In addition to the exciting new research projects outlined above, GI-ACE also includes three projects that were awarded follow-on funding from the first phase of the DFID-sponsored Anti-Corruption Evidence programme (2016-18). Liz Dávid-Barrett of the University of Sussex leads a team exploring the regulatory framework of donor recipient countries and their interaction with donor regulations, looking to extend their innovative analysis of ‘red flag’ risks revealed by the big data analysis of procurement. They are particularly interested in potential displacement effects. Scott Newton of SOAS is working with colleagues to extend their exploration of how network-based governance systems based on informal practices impact on specific anti-corruption reforms, seeking to design ways to ensure these deliver more effective results than more formal mechanisms have managed. Finally, Jan Meyer-Sahling of the University of Nottingham is developing the work he and colleagues did on civil service management practices to focus specifically on ethics training in Nepal and Bangladesh, using randomized controlled trials to identify best practice interventions. The post Open Government beyond OGP: Reflections from Veracruz, Mexico appeared first on Global Integrity. The post Más Datos, Menos Corrupción? appeared first on Global Integrity. En abril de 2018, los Jefes de Estado de las Américas firmaron la Declaración de Lima “Gobernabilidad democrática contra la corrupción”, donde se comprometieron, entre otras cuestiones, a promover el “establecimiento de un Programa Interamericano de Datos Abiertos, en el marco de la OEA, con el objetivo de fortalecer las políticas de apertura de información, e incrementar la capacidad de los gobiernos y ciudadanos en la prevención y el combate a la corrupción”. Sobre la base de ese compromiso y de la 48ª Asamblea General de la OEA de junio de 2018 que dispuso el establecimiento del Programa, la OEA convocó un taller de dos días la semana pasada en Washington DC, con el objetivo de explorar cómo se vería ese amplio compromiso en la práctica y comenzar el diseño del Programa Interamericano de Datos Abiertos para Combatir la Corrupción. “Para tener una política de datos abiertos exitosa, es necesario tener el problema que se quiere abordar bien identificado, abordar las prioridades y capacidades locales, y crear coaliciones de múltiples actores interesadas, incluyendo productores y usuarios de datos que puedan apropiarse y aprender del proceso”. Ania Calderón, Carta Internacional de Datos Abiertos. “No se trata sólo de abrir los datos, sino también de tener ciclos de aprendizaje, problemas concretos, procesos inclusivos y compromisos sólidos respaldados por recursos y capacidades institucionales”, Georg Neumann, Alianza para las Contrataciones Abiertas. “Al poner en práctica la Guía de Apertura sobre Anticorrupción en México, tuvimos un enfoque evolutivo, que comenzó con seis conjuntos de datos clave y luego se amplió la escala. Es crucial involucrar a los ciudadanos, las organizaciones y las comunidades que pueden utilizar los datos publicados y mostrar su impacto”. Enrique Zapata, el Sistema Nacional Anticorrupción de México. “La hipótesis de que la publicación de datos ayudará a enfrentar la corrupción es demasiado simple. Sin embargo, considerar ciertos conjuntos de datos y su uso por parte de actores clave del gobierno y las OSC para detectar posibles riesgos podría demostrar el uso positivo de esos datos. Creemos que este programa puede ser un gran paso para explorar el uso y análisis de los datos anticorrupción en la región y probar qué sirve y qué no”, Silvana Fumega, ILDA. Pero, ¿más datos equivalen a menos corrupción? Después de un intercambio muy inspirador, todos llegamos a la conclusión de que definitivamente no es así. Los datos por sí solos no son suficientes; debemos considerar medidas adicionales como la creación de capacidades institucionales, acuerdos locales, mejores marcos legales y buenos mecanismos de rendición de cuentas. Pero también es importante agregar flexibilidad, aprender de las experiencias y establecer un proceso evolutivo para el éxito del programa, dado que no sabemos qué funcionará en diferentes contextos. un objetivo marco, que consiste en fortalecer la apropiación y las capacidades de los actores locales mientras buscan utilizar datos abiertos para abordar los desafíos específicos seleccionados en cada contexto. ciclos de monitoreo, evaluación y aprendizaje en tiempo real que informan y mejoran los esfuerzos para utilizar datos abiertos para elaborar soluciones a los desafíos relacionados con la corrupción. 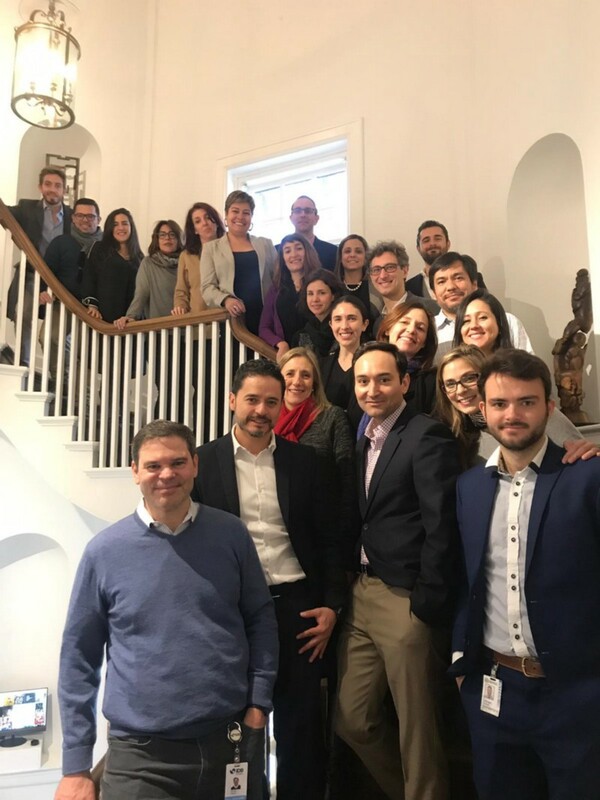 Ahora, los 35 estados miembro de la OEA tienen que aprobar un programa más detallado en su próxima Asamblea General, que será organizada por Colombia en junio de 2019. Una vez firmada, comienza la acción. Estamos muy emocionados de ver lo que este programa puede lograr. El taller, que reunió a organizaciones y organismos internacionales del continente, fue inspirador, creativo y divertido, y nos dejó un gran optimismo sobre el potencial del programa y emocionados de ser parte de él. Creemos que será crucial prestar especial atención a los diferentes niveles de progreso que tienen los países, y desarrollar un programa que satisfaga sus diferentes necesidades y capacidades, trabajando con socios locales para abordar los desafíos específicos que presenta la lucha contra la corrupción.